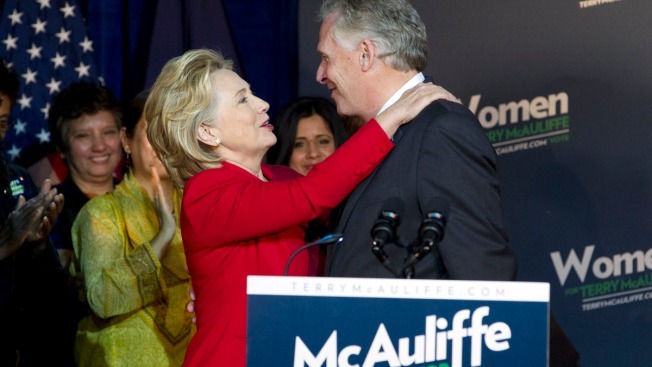 Virginia gubernatorial candidate, Democrat Terry McAuliffe, gets a hug by former Secretary of State Hillary Rodham Clinton during a campaign rally, Women for Terry, at the State Theater in Falls Church, Va. on Saturday, Oct. 19, 2013. Clinton formally endorsed her family friend's bid for Virginia governor, marking her first public campaign event since departing the State Department in February. Hillary Rodham Clinton has joined Democrat Terry McAuliffe on the campaign trail, telling Virginia voters the nation is looking for a return to "common sense and common ground." Clinton formally endorsed her family friend's bid for Virginia governor, marking her first public campaign event since departing the State Department in February. The former secretary of state says voters are watching the race for a sign that the country would turn away from "divisive politics" after the government shutdown. Clinton has largely avoided politics this year but is helping McAuliffe as well as former campaign aide Bill de Blasio in his bid for New York City mayor. Democrats consider Clinton a leading candidate for the White House if she decides to run in 2016.